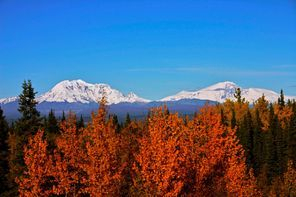 "Wrangell-St. Elias National Park & Preserve"
The National Park Service likes to say that Wrangell-St. Elias Park, America's biggest, covers 13.2 million acres, and is as large as Switzerland. In some ways, it's a lot like Switzerland, full of mountains and glaciers and snow. In other ways, it isn't. Switzerland is a well-known, well-used place. Wrangell-St. Elias is so big, and so wild, that its extremes dwarf anything Switzerland has to offer. For one thing, it's a lot colder than Switzerland. Part of the reason is that Switzerland is only at Latitude 46, and Wrangell-St. Elias Park, which overlaps much of the Copper Valley and historic Ahtna Indian country, is located from Latitude 60 to around Latitude 62. The park contains all the Wrangell Mountains that you can see from the Copper Valley (there are 4 major ones: Sanford, Drum, Wrangell & Blackburn) plus a whole bunch of the rest of the mountains in this huge range. Mt. Wrangell, which is a big, sloping mountain, is the only one that's officially considered an "active" volcano, although there are many volcanic peaks in this range. Around 60% of all glaciers in Alaska are in Wrangell-St. Elias National Park. The Malaspina Glacier is the biggest piedmont glacier in the U.S. and Canada. The 75-mile long Nabesna Glacier is the world's longest valley glacier. The Hubbard glacier, also 75 miles long, is the longest Alaskan tidewater glacier. And the Bagley Icefield is the biggest icefield in North America. (There are bigger icefields – but they're at the poles.) The Bagley icefield is 3,000 feet thick, and is an incredible reminder that up to 10,000 years ago, there were huge icefields, up to a mile thick, all over Canada and the northern parts of North America. Caution: This is an extremely wild national park. It has very few trails, intense weather conditions, extreme isolation, and a limited staff. Do not attempt to go backcountry in this park without first consulting with park personnel and the BLM, and without maps, adequate clothing, food and enough information to understand what you're doing. If you travel on glaciers, always go with paid guides who know what they're doing. The Copper Valley's big active volcano, Mt. Wrangell, was named after a Russian admiral, Ferdinand von Wrangel, during the heyday of Russian ownership of Alaska. Alaska was so "new" to outsiders that they felt that every time they saw something interesting, they were the first people to ever see it. So, like Adam, they felt compelled to name everything in sight. The other mountains visible from the Copper Valley were named in 1885, by one Lt. Henry T. Allen, the first American who trudged his way through the region, imparting his own brand of "ownership" by renaming anything that struck his fancy: Rivers, mountains, canyons... He named mountains after friends, teachers, and political dignitaries. He named rivers after various companions on his trip. But the real name of three of these huge Wrangell mountains – the Ahtna Indian name – is K'elt'aini. The Ahtna traveled up to the foothills of these mountains to hunt, sending their young men to find sheep and to learn to be strong and resourceful. This is a terrific park to visit. Wrangell-St. Elias National Park is not only a very big park, it's also a very new park. It was officially named in 1978. The park is just on the other side of the Copper River, but you can't get to it by road except to the north, on the Nabesna Road, and the south, on the McCarthy Road. 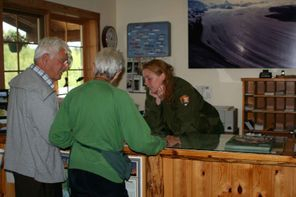 You can go to the National Park facilities at Copper Center and learn about Wrangell-St. Elias. 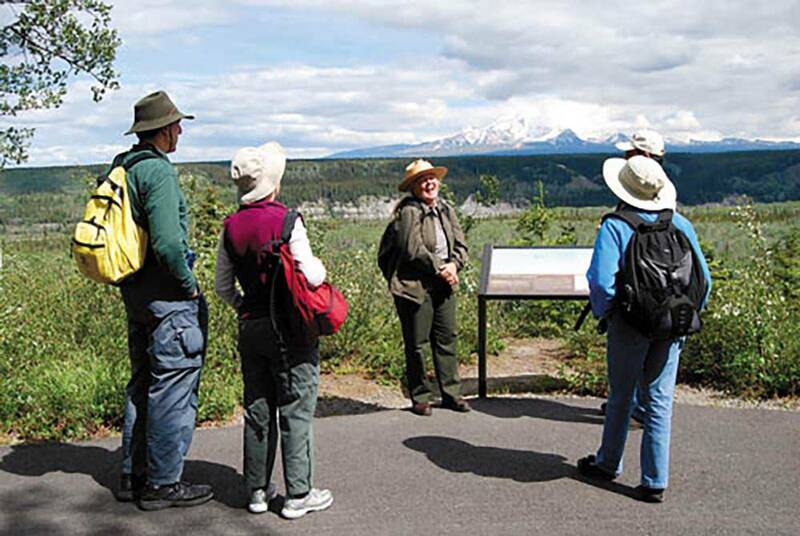 There are ranger talks, short walks, and maps and visitor information. 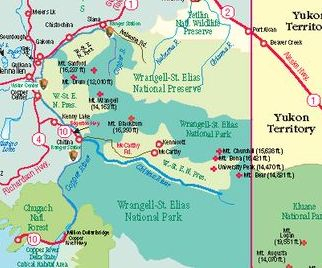 But, please note, although you are at the park's major visitor center here, you are far from actually entering the park, which is not accessible by bridge in the Copper Valley except on the McCarthy Road, past Chitina. Ten miles south of Glennallen on the Richardson Highway, at Mile 106.8 Richardson Highway, on the "mountain" side of the highway. Contact them by calling 822-7250. 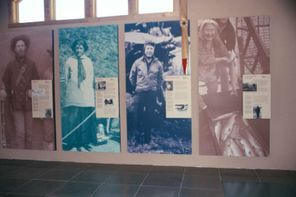 You can learn a lot about Wrangell-St. Elias in Copper Center's National Park Service Headquarters. But that's just not the same as heading down the McCarthy Road and actually seeing the park for yourself. 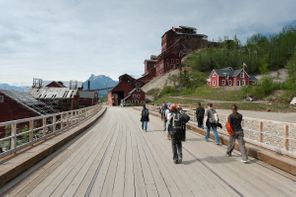 McCarthy and Kennicott (also known as "Kennecott") are a tremendously exciting location to visit. Here, you can see America's tallest wooden building, the Kennicott mill, still standing, all 14 stories of it. The wealthy Guggenheim Family (long a part of America's fabled "1%") ran the copper mines here. They bought the mines in 1903, taking the valuable copper from the Ahtna people. The mines worked full-bore until 1938. By 1938, the copper companies decided they had taken all they wanted, and abruptly pulled out of Alaska, leaving behind all their documents, papers, dishes, and everything else, neatly in place as if they would soon return. They never came back. Although the copper mines tried to hire locals to demolish the Kennicott buildings after they left town, the structures were too sturdy to take down, so, by a fluke of fate, they still exist. 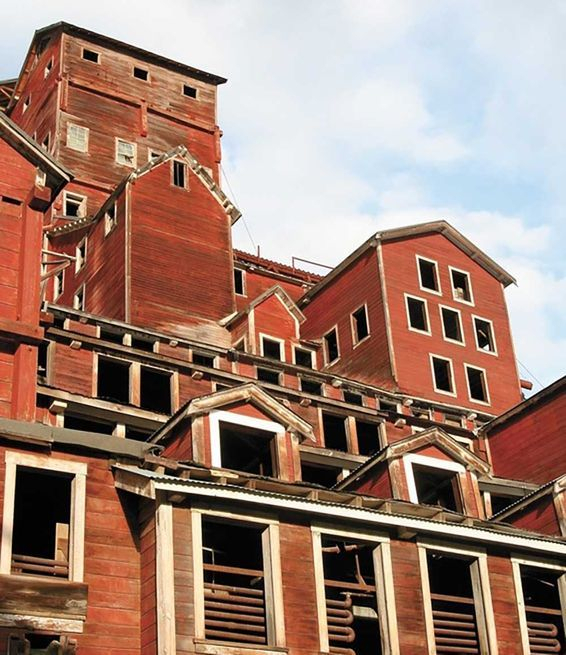 Many Alaskans wanted the mines to crank up again, but the owners weren't interested, and eventually, the core of the historic buildings were taken over the National Park Service, which has spent a number of years trying to salvage key buildings for historical purposes. The mine buildings are unique in that they show the ability of sheer wealth to transform an immensely isolated part of Alaska into a sophisticated place, where they had electricity, a hospital, regular train service, and just about every amenity that was available at the time in the Lower 48. The McCarthy Road is 59 miles long. It's a dirt road. Drive it with care. Many motor home rental and car rental companies in Alaska don't allow their cars to be driven on this or any other dirt road. 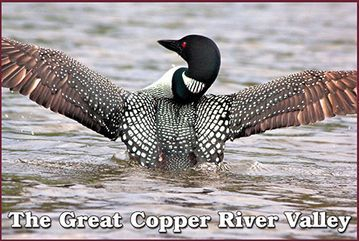 You can choose to use a shuttle van from the central Copper Valley, or also get there by plane. Located at Chitina during the summer months, in a an historic 1910 log cabin. Closed Tuesdays and Wednesdays. Call Chitina's rangers at 823-2205. At Mile 59 of the McCarthy Road, this is a self-service kiosk, with a phone that connects you to the Kennecott National Park Visitor Center during the workday. Once you arrive at the bridge to McCarthy, you cross it, and then call for van service at a phone available there. They'll take you 5 miles to Kennicott, for a very reasonable price. You can walk around Kennicott and view the old mills. There's a visitor center there, on the main road to the mills, that is well-marked. Call 554-1105. There are only two road access entries to the National Park. The major route in, shown above, is the McCarthy Road. The Slana/Nabesna entrance is off the Tok Cutoff, at Slana, the entrance to the Nabesna Road. There's a ranger station at Slana, half mile down the Nabesna Road. Call 822-7401.